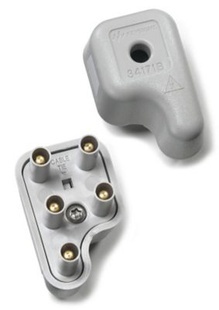 The Keysight 34171B DMM input terminal connector block is a set of two connectors which provide a convenient and reliable method to connect wires to all five input terminals. Terminals are made of low-thermal copper alloys to minimize thermally-induced voltages caused by dissimilar metals. For minimum thermal offset voltages, use unplated copper wire of the same gauge for all connections. The Keysight 34171B is compatible with the Keysight 34460A, 34461A, 34401A, 34410A, 34411A, and L4411A digital multimeters.